In ion assisted deposition the goal is to modify the properties of a growing thin film by directing an ion beam at it. 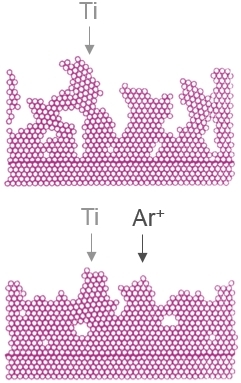 Ion assistance is often used in combination with thin film deposition by evaporation or other techniques, for which the kinetic energy of the arriving particles is low. For such deposition methods the coating can have a low packing density, large void fraction, relatively large grains, and internal tensile stress. By directing an ion beam at the surface during the deposition process energy is delivered to the growing thin film, which can help densify the film. Ion assisted deposition can also be used to purposely introduce compressive stress in the film to improve its mechanical properties. The effect of the ion beam on the nature of the growing thin film depends on multiple factors. A major one is the energy that is delivered to the surface per deposited atom (eV/atom). This energy should be high enough to help move atoms around, but not too high to melt the surface. These energies vary with the deposited material and the upper limit can be between a few and several hundreds of eV per atom. The angle of the ion beam with the surface is also a relevant parameter, as it can influence the roughness of the surface. This may be of particular importance for multilayers that need to have sharp interfaces. The thin film deposition rate and the desired energy per atom the ion beam should deliver determine together the required current density of the ion beam of a given energy. This current density can be a few up to a few hundred µA/cm². Ion beam assisted deposition is typically done at low beam energies, up to several hundreds of volts, to avoid sputtering or etching the growing film. The stability and reliability of our ECR technology is attractive for ion assistance applications. For our sources there are no hot filaments that burn out and need to be replaced. Depending on the surface area that needs to be treated we offer single cavity sources or multi cavity sources, both with well-controlled and tunable beam energy. For larger areas, the multi cavity solution has the additional advantage that the beam shape can be adapted to the surface geometry (circular, annular, linear, etc). Read more about custom beam solutions here.